Suomalaiset Sävelet ("Finnish Tones" in English) is one of the biggest TV and radio productions on the history of Finnish classical music, produced by YLE, Finnish Broadcasting Company. Suomalaiset Sävelet contains eight programmes, the first programme starting from the early dawn of Finnish Music, and ending up to the present music in the last programme. There are two versions on this eight part serie, a) television (film) version was made for the Finnish television (broadcasted many times on TV1 and Teema channels), and b) radio version was edited for Yle Radio 1. Duration of each TV programme is 30 minutes, radio programmes are 45 minutes long each. 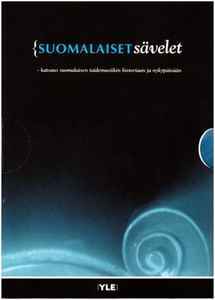 The Suomalaiset Sävelet film serie (parts 1-8) was released on DVD, and radio serie (parts 1-8) on eight CDs in 2006-2007 by YLE. The distributor of these releases is YLE Shop. YLE has also released all eight Suomalaiset Sävelet television programmes, and all eight radio programmes together in a box of two DVDs, eight CDs and a book on Finnish composers. The second DVD in the box is entitled as Suomalaiset Sävelet Jr. DVD. Suomalaiset Sävelet, Osa 8 (Engl. Finnish Tones, Part 8) is the last programme of the eight part serie, and this programme is focused on the contemporary Finnish music, starting from the 1970s and from the composers around Ears Open group, and ending up to introduce the use of computers and discussing on the concept of media composition in contemporary music.